Ten million Jews lived in Europe in the late 1930s. They were distributed among four zones, each with a different history, divergent conditions of life, and, on the face of things, varying prospects for the future. In the democracies of western Europe, Jews had been emancipated for several generations and enjoyed a civic equality that, in spite of the rising tide of anti-Semitism, protected them, for the time being, against any threat to their security. By contrast, in Germany and those parts of central Europe that had already been absorbed into the Third Reich, Jews were in the process of being stripped of citizenship, subjected to discriminatory laws, driven out of the professions, and deprived of the bulk of their possessions, and were under intense pressure to emigrate. In a third zone, comprising all the states of east-central Europe, anti-Semitism, often drawing on deep popular roots, formed a significant element in political discourse and in most countries had been integrated into public policy in the shape of explicitly or implicitly anti-Jewish laws. Finally, in the Soviet Union, where the Jews had been emancipated in 1917, later than anywhere else in Europe (save only Romania), they enjoyed dramatic upward social mobility in the interwar period. But collective Jewish life, whether religious, political, or cultural, was, like other aspects of existence under Stalin, subject to severe restrictions. In German, the word Judentum means simultaneously “Judaism” and “Jewry.” But in the heart of the European Jew since the Enlightenment a schism had arisen between the conceptions of Judaism as a religion and as a Volksgemeinde, a community based on common ethnicity. In France, since their emancipation during the revolution, many Jews had come to regard it as a cardinal principle that Jewishness was a purely religious category and that in every respect they were as French as other Frenchmen. In Germany, where emancipation had come later and where social relations between Jews and gentiles, even in the liberal Weimar period between 1918 and 1933, were more fragile, matters were slightly different. There, writes George Mosse, a scion of the German-Jewish elite, “there was no either/or—either German or Jew. . . . Jewishness was not merely a religion but was primarily linked to pride of family, from which it could not be divorced.”1 In eastern Europe, where boundaries of state and nation rarely ran together, and where most Jews still spoke Yiddish, lived in dense concentrations, and held more closely to their own cultural patterns, Jewishness tended to be seen by Jews themselves as well as by their neighbors as primarily an ethnic category. This was true also in the USSR, where “Jewish” was a legally recognized national distinction. The democratic zone of interwar Europe was the most comfortable for Jews. But it held the smallest share of the continent’s Jewish population, under a million, or less than 10 percent of the total. In western Europe, however, the security that Jews enjoyed was no longer quite so automatic or unquestioned as in the past. True, a Jew had been elected prime minister of France in 1936. But the socialist Léon Blum’s victory as head of the left-wing Popular Front was regarded as a mixed blessing by many French Jews. The government’s enemies on the right focused on Blum’s Jewishness and used it, to some effect, as a propaganda bludgeon against the left. Even in the Netherlands, with its long history of Christian-Jewish amity, stretching back to the friendly reception of “New Christians” (Marranos) from the Iberian peninsula in the sixteenth and seventeenth centuries, a certain unease entered into the relationship in the 1930s following the arrival of large numbers of refugees from Nazi Germany. The phrase heureux comme un juif en France (“happy like a Jew in France”) had come to have the proverbial meaning of very happy. But over the previous generation it had often been tinged with irony. At the turn of the century, the Dreyfus Affair had suggested that there were limits to the recognition of Jews as French. Since 1919, with the return by Germany of Alsace and Lorraine to France, French Jews, a majority of whom traced their origins to the two regained provinces, might again feel content to be fully part of the national patrimony. But their enemies now turned the phrase against them, suggesting that the Jews were too happy in France, in other words that they were doing too well, at the expense of others. In its origin, the phrase was a play on the German/Yiddish leben wie Gott in Frankreich, which meant to live very well. Under the Weimar Republic in Germany, Jews looked forward to the consolidation of more than a century of progress toward legal equality and social acceptance in a country and culture in which they felt no less at home than French Jews did in France. Bernard Wasserstein is Ulrich and Harriet Meyer Professor of Modern European Jewish History at the University of Chicago. His many previous books include The Secret Lives of Trebitsch Lincoln, which was awarded the Golden Dagger for Non-Fiction by the Crime Writers’ Association, and Barbarism and Civilization: A History of Europe in Our Time. “A bright, hard glimpse at the final thriving days of European Jewry…[s]traightforward, scholarly and tidily organized…[a] wide-ranging, marvelously complete overview of a diverse, teeming civilization poised for ruin." 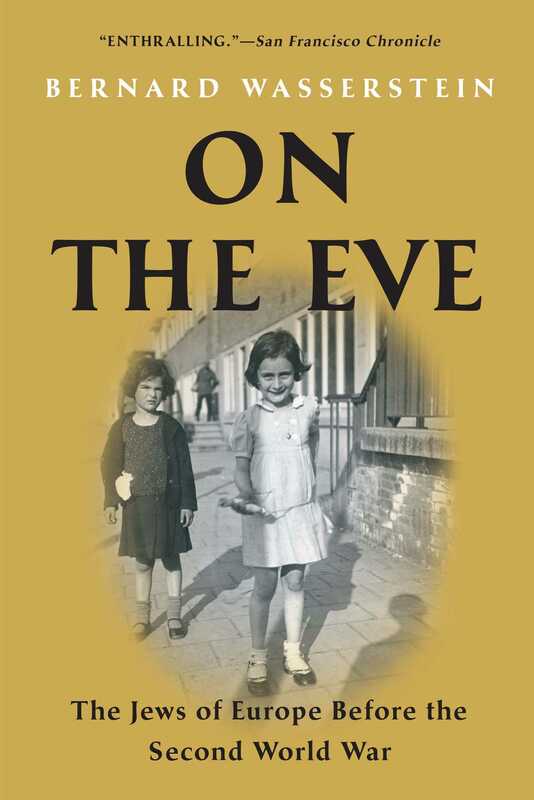 "At last, we have a comprehensive, richly textured account of Jewish life in Europe before the Holocaust. Bernard Wasserstein is unsparingly honest in his portrayal of a highly diverse, highly accomplished community, weakened by internal divisions and demographic decline as a much larger disaster loomed. On the Eve is essential reading for anyone seeking to understand the world that was about to disappear." "Takes the reader step by step through the history of the Jews of Europe between the two world wars and provides a comprehensive survey of their situation throughout the continent. It is a rare and excellent introduction, an evaluation that furnishes a deeper understanding of the events of the Holocaust."